Our kitchen had some outdated linoleum countertops that were already starting to peel off. We went to the home improvement store to check out what options were available, and I’ll be darned, I must have great taste… because every surface I gravitated towards was like a million dollars a square foot. So instead, Drew had the idea of doing wooden countertops like we’d seen in magazines. I am so pleased with the result and excited to share this tutorial with you! 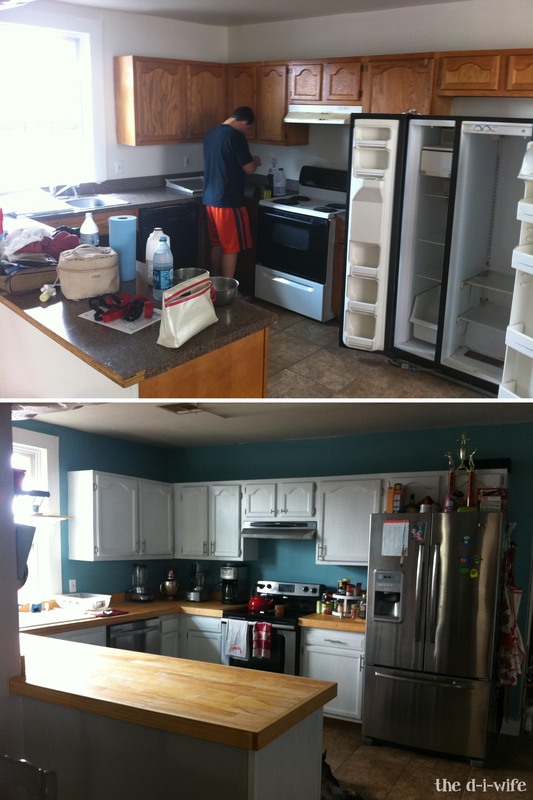 Keep in mind, this is part two in the Kitchen Makeover post. 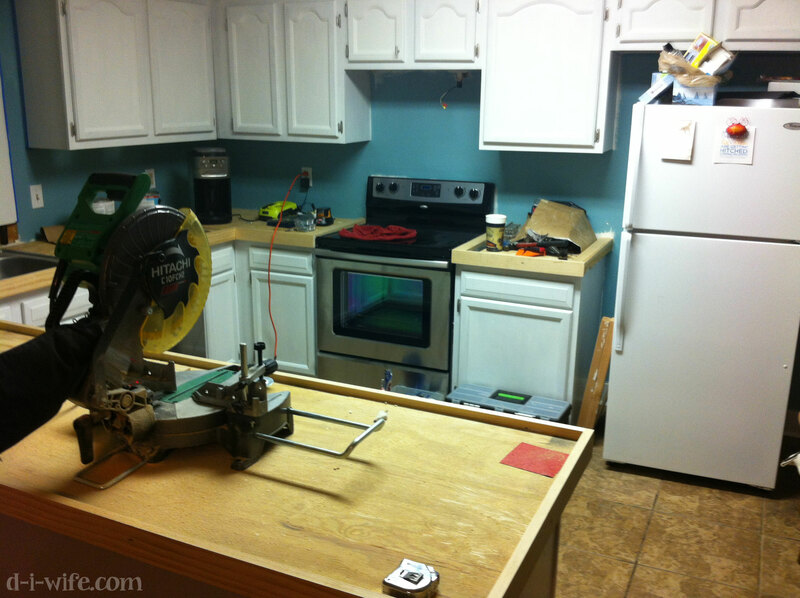 If you’re interested in how we refinished the existing cabinets, click here. 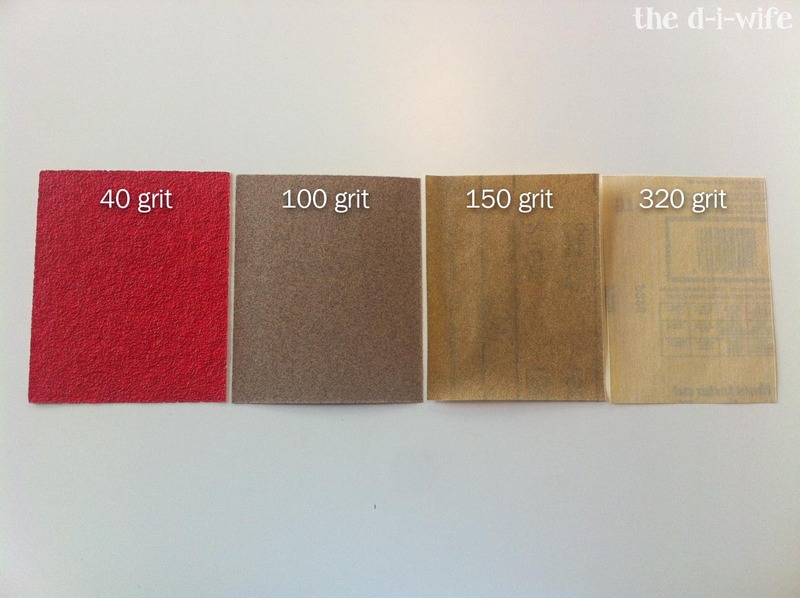 Using a very coarse sandpaper (we used a 40 grit) and a palm sander, exfoliate off any remaining adhesive from the base wood of the countertops. Start in the corners and work your way out. 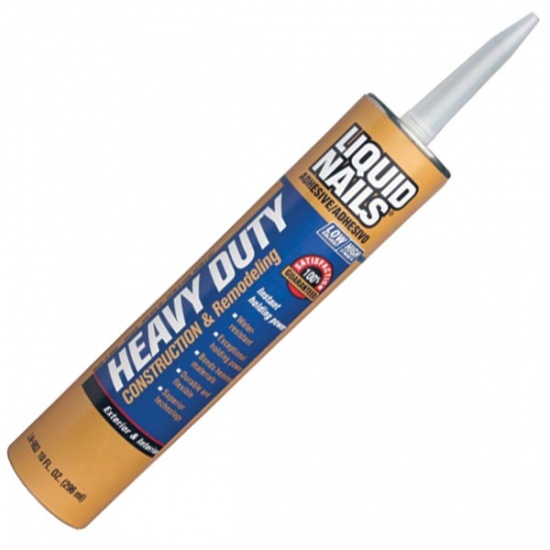 Apply a liberal amount of Liquid Nails on the base wood, then add pieces of wood one by one. I just cut a bunch of pieces in various sizes between 8-20″ for variation. As I got to the end, I cut pieces to specific sizes. 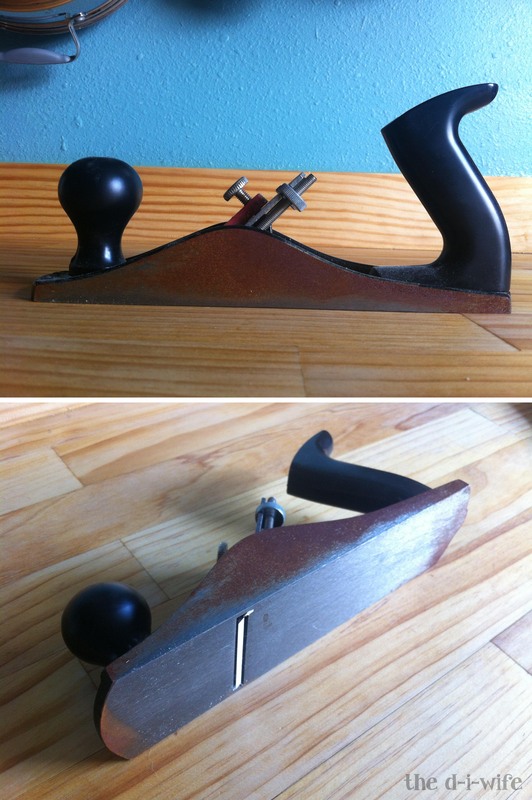 If you have some areas that are drastically uneven between boards, use a hand plane to shave off the top. 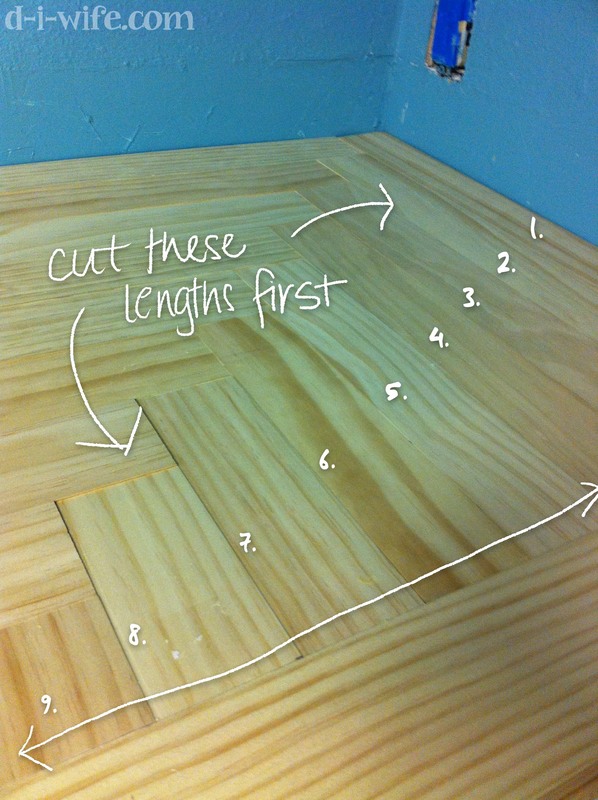 Make sure to go with the grain of wood, this will help avoid taking off big chunks. Beware: there is a razor on the bottom of this thing. It’s REAL SHARP. Be very careful! With a dang respirator on your face, paint on a generous coat of sanding sealer. After it dries, it will feel rough to the touch. That’s totally fine. It will all come off in the sanding process. Start with a coarse grit of 100 and work your way up to a fine grit of 320 until that surface is smooth like butta. 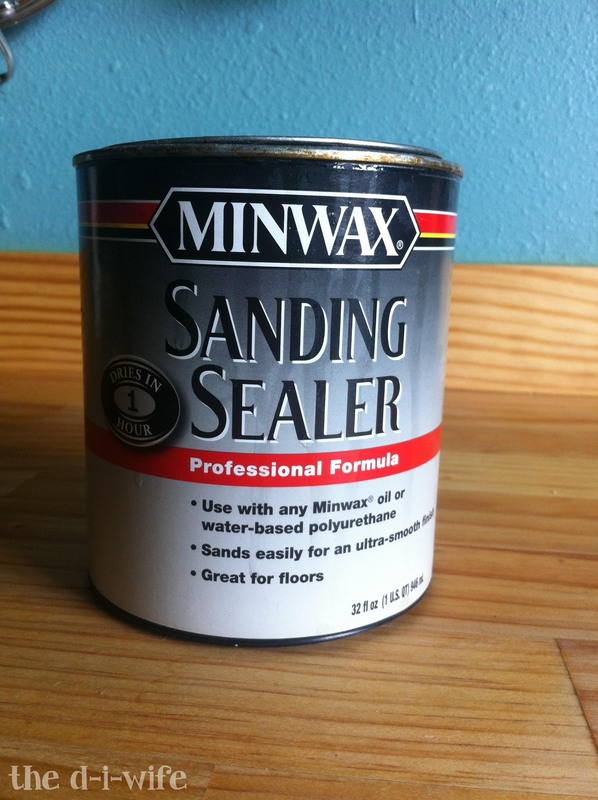 Between each run of the sander, rub the sawdust into the cracks. This will help seal in any gaps in the end. 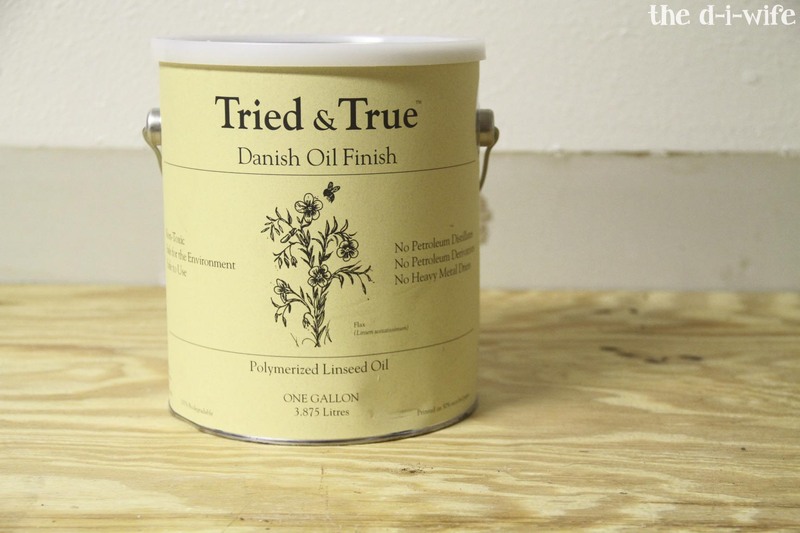 Apply a generous coat of Tried & True Danish oil. With a clean, lint-free rag wipe the excess into the wood. Repeat until satisfied. Just look at how pretty they turned out! For about $300 in materials, these wooden countertops have a big impact. Depending on the size of your countertops, each step may take a while– but the techniques are simple and super gratifying. 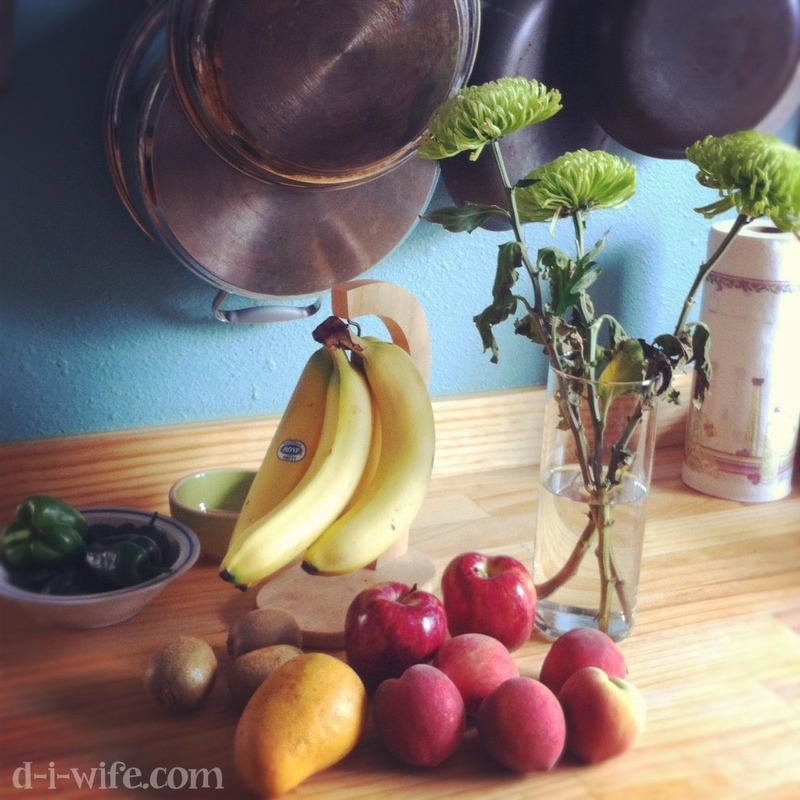 When we began discussing countertop options, I was very hesitant to the idea of preparing food on wooden surface. Not only was I worried about germs and stuff, but I was also concerned about how stain-resistent it might be. Red wine, coffee, grease all sounded like potential threats to a beautiful wooden countertop. But my sweet husband just said, “Trust me. If it doesn’t work, we’ll rip it all up and try something else.” And with trepidation, I said okay. Do you like the way they turned out? Do you think you could/would/should try this at home? How about the post– do you like having all the photos between steps? How can I make this better? Leave your thoughts in the comments section. Posted in Carpentry, Home Improvement, Uncategorized and tagged butcherblock, carpentry, countertops, diy, diycountertops, woodencountertops. Bookmark the permalink. Beautiful job! I really love your wall color. Looks really close to what I have in my living room! Haha! Yeah I totally noticed that in your post! I saw your DIY Moroccan Stencil post from Bob Vila’s twitter. The way you write, I think we are blog-lost sisters. Looks great. Not showing it to my husband because he wanted wood, and I poo-pooed it. Haha! I completely understand, I was against it at first because I worried about germs and stains and wood doing what wood does–warp. But I have to say, they are holding up beautifully and are just as easy to clean as any other surface. And seriously, it was SO EASY. Godspeed with your DIY endeavors! This is incredible. I’ve just spent the morning searching for DIY wood countertops as ikea discontinued the butcher block one we were planning to use this spring when tackling our half kitchen Reno. I’m sending this link toy husband. It looks amazing! I love this idea and have been trying to convince my husband we should do this… Can you tell me more about the wood that you used? Hi Thresa! Thanks so much! We just used a basic 1×3 of medium-high quality. We only spent about $200 on wood. You can measure the square footage of the countertops and estimate how much you’ll need. I was in the same boat as your husband, but mine said “Hey, if you still don’t like it, it was only $200, we’ll rip it up and try something else.” Worked for me and I’ve been happy as a clam with them ever since. Hey Thresa! We used a nice quality 1×3″ pine. It was pretty smooth (an indicator of quality, should be a couple different grades at your local lumber yard) and we looked for pieces that weren’t warped. We do this by squinting one eye and gazing down the length of a board to see how curvy it is. If it’s bending a lot and you’re using short pieces, that ain’t no good. Choose pieces that are nice and straight. As for your wood– go with what speaks to you! I’m curious how you approached the sink area. Did you remove the sink or work around it? Also would you recommend painting cabinets before installing the wood? We actually replaced the old aluminum sink with the white porcelain one shown. We removed it by disconnecting the plumbing and scraping off the adhesives around the sides. When we laid the wood, we framed it out to the size of our new sink (which was just about the same) and sealed it with a clear waterproof silicone caulk. Does this help? And absolutely paint the cabinets before. I’ll be real real with y’all that the painting process we drug out over several days (you know, dumb real jobs and stuff…booooooo). Especially if you’re going dark to light, the white paint required a couple coats and we spread them out on the kraft paper all over our kitchen. 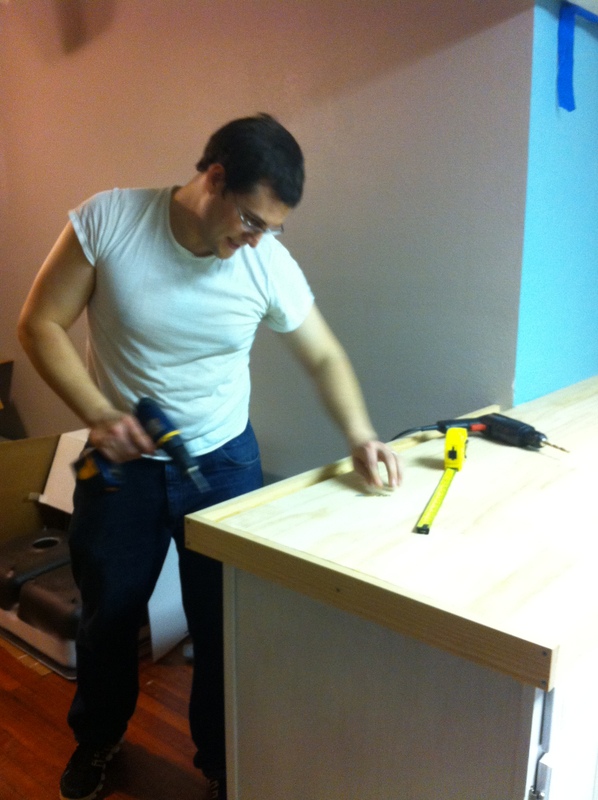 I am in the process of building these countertops right now! Thanks! I don’t have Instagram… can I email them to you? Absolutely! lizcookedesigns [at] gmail [dot] com. I can’t wait to see!! Love the wood counters, but I’m looking for a darker finish. Can you stain the wood and then seal it some how? 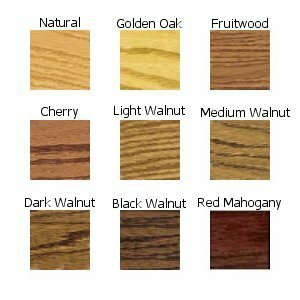 Hey Chana, I just did a quick google search for Danish Oil stains, and it looks like there are many different color options. I would make sure they are food-safe before applying it to your countertops. If I find one that definitely is food safe, I’ll be sure to share with you! We are working on updating our older home to sale. Would you recommend these? Also, how do you clean them…what do you use?? Hey there! I use Mrs. Meyer’s countertop spray or Clorox wipes. They still look great after many spills and many cleanups!! LOVE these!! Hope to give it a try this spring! I was just wondering though if you sealed them after to stained them? Like with a poly or anything?? Also do you use yours as a cutting board countertop or still use a separate cutting board? Thanks so much!!! 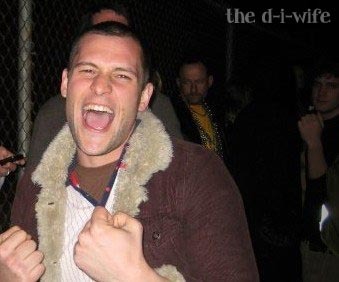 Hey Ali! Thanks so much! The Danish Oil did the trick– no nasty poly needed! We will be reapplying our Danish Oil for the first time since installing 2 years ago soon. So low maintenance! We do use separate cutting boards because…well, we have a couple cats who are under the impression that they rule the house or something and like to stroll the kitchen countertops. 😐 But, if you wanted to, you totally could! 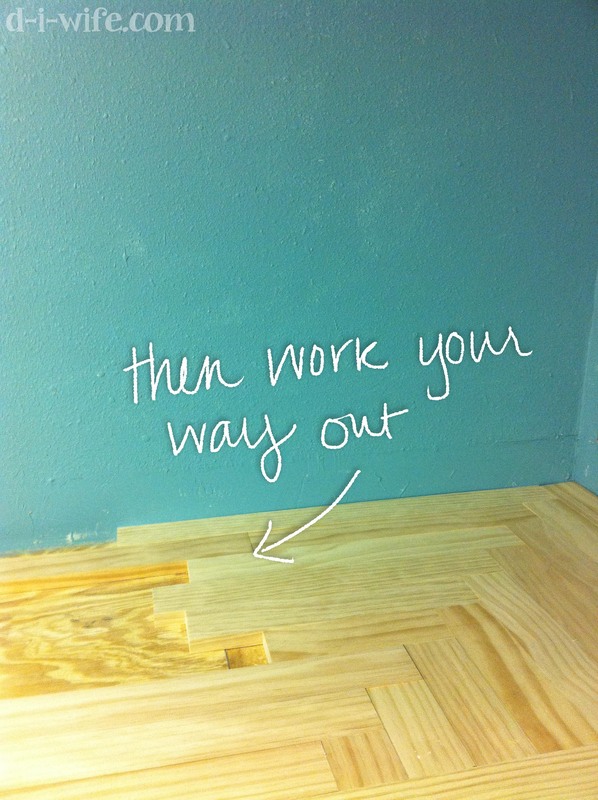 What did you do to prevent a ton of dust blowing around during the sanding step? Good question! We didn’t do so much preventative prep as much as we did sweeping after. ha! Truthfully, there wasn’t too much sanding particles that got blown around, but it was certainly easier to when we installed the same countertops in our rental unit this summer, which was vacant at the time. I bet some plastic sheeting would go a long way in containing the dust. Can you give us an update on how these are holding up? I’m curious if it has aged nicely. Thanks! They’re still looking beautiful as ever! Stain resistant and lovely shine! how would you use an undermount sink? You’d need to install the sink first and cut your wood to fit over it. Lemme know if that helps! Beautiful! My husband and I are redoing our house to sell next sumer and we are going to try this! I just wanted to know what type of wood you used? It looked like pine? Can you do this with red oak, hickory or poplar? Just wondering since they are such hardwoods . thanks! I’m sure you could! Send pics when you do, I’d love to see them! How long did it take to remove the laminate and was it hard? How did you not gouge the base surface? Why couldn’t you just apply wood over the laminate? The base surface was a big sheet of plywood, and the linoleum was already peeling so it was better to strip it off. It came off pretty easily with a couple chisels and hammer. We had it off in under a couple hours! Why did you have to take the countertops off? Couldn’t you just have roughed them up with sandpaper and put the wood right on top of it? Hmm, I guess we could have, but because the linoleum was peeling in some places, the wood wouldn’t have set level and there would have been gaps. Plus I hated it and wanted to take my aggression out on the linoleum. ha! How did these hold up?! Love your tutorial! We did something similar with our kitchen countertops but are having issues with sealing. Water got between the planks and the wood has expanded leaving larger gaps between planks. Any tips?! Oh no! I’m sorry to hear that!! One super smart thing my husband did was smooth dust from sanding into the cracks, which filled in the gaps and sealed completely with the Danish Oil. Hope that helps!